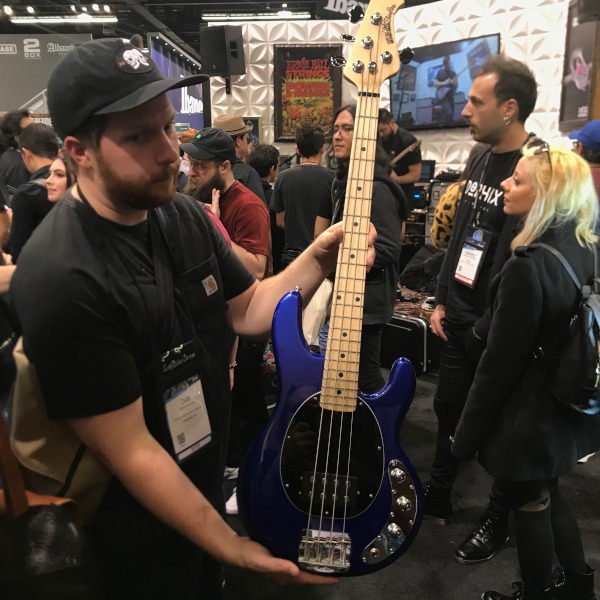 Another NAMM is in the books, but we still can’t stop talking about the awesome gear and people we saw there. 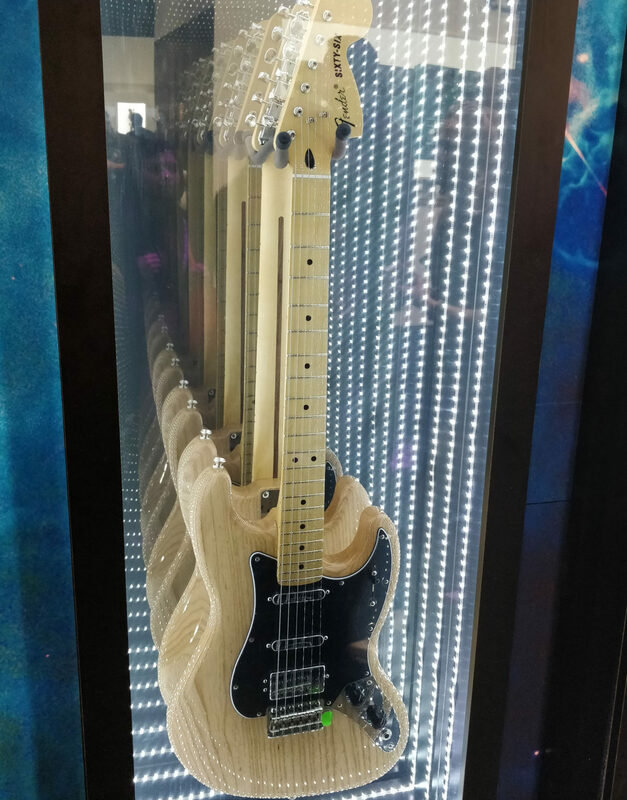 Check out our rundown of the coolest things we saw this year at NAMM! One of the hottest launches of the 2019 NAMM Show was the Akai Force. This brand-new grid-based music production system looks like a cross between the Ableton Push pad controller and Akai’s MPC Live, with an 8×8 grid of pads, 8 knobs, a 7” color touchscreen, and a DJ-style crossfader. Unlike your traditional MPC, the Force doesn’t lock you into a sequencer click — it’s a more flexible tool for recording and performing nearly any style of music. Featuring two onboard mic preamps, CV/Gate I/O, MIDI In/Out/Thru, and USB MIDI, it’s ready to connect to all your studio gear. And yes, you can plug the Force into your computer to use it as an Ableton Live controller. But like its older cousins Akai MPC Xand MPC Live, the Akai Force is designed to be a standalone production and performance platform, complete with internal storage and two onboard synth engines — as electro-pop artist Neon Vines demonstrated in her live demos at Akai’s NAMM booth. Check out our video to see her sing, tweak effects, and rip a synth solo on the Force, playing its pads and knobs as an instrument. We can’t wait to see more artists use the Force in their stage and studio rigs in 2019! Gibson’s entire idea of calling back to the “golden era” of guitar making is something I’ve wanted them to do for years. The Gibson Les Paul Standard ’50s was a standout from the show for me because it’s exactly what I’ve wanted for several years. It’s also a standard production model so you don’t have to spend some custom shop money just for some vintage features. Kluson style tuners, a standard sunburst finish, and the absolutely dead-on late 1950s neck profile (also known as the “holy grail” neck profile) really make these “golden era” models so desirable. The price point might be the greatest part of the guitar because it’s actually a little more affordable than previous generations of Les Pauls. 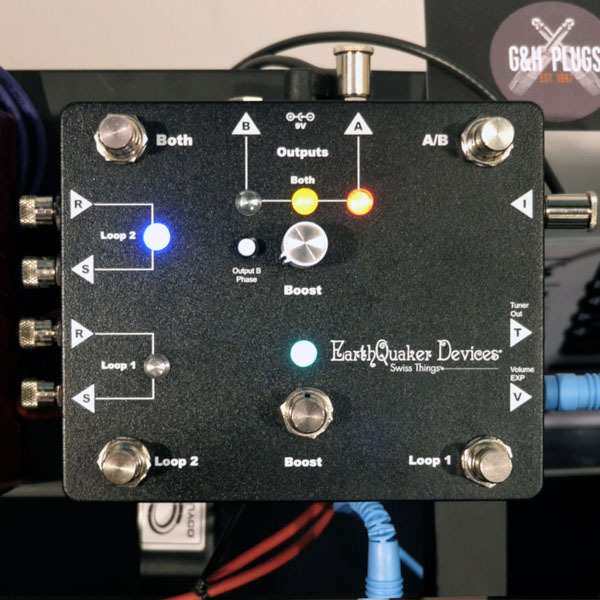 The Swiss Things wasn’t launched at NAMM, but it is the newest offering from Earthquaker Devices. At first glance this utility switcher may seem less exciting than a gnarly fuzz or a lo-fi delay pedal, but it is packed full of game changing features. The Swiss Things has two signal path loops, A/B – Y switching, a great sounding clean boost, a tuner out, an expression pedal input, and it buffers your signal so you don’t have to worry about tone loss when running through a big pedal board. On paper this already sounds great, but after I spent some time at the Earthquaker booth trying it out with a full pedalboard and started imagining different creative ways I could route pedals before, after, and inside the two loops, it became obvious this is a must have utility switcher for anyone who is a serious effects junkie. 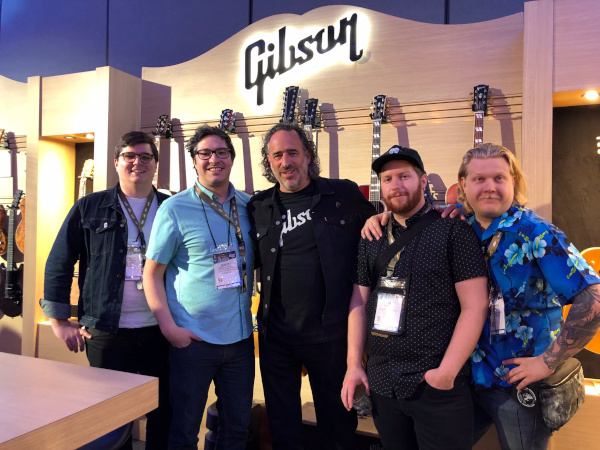 The Henry Juszkiewicz-led decline of Gibson over the past few years has been hard to watch, but with a changing of the guard at the executive level in late 2018, all eyes were on Gibson for their return at NAMM 2019. The zZounds team and I had the chance to meet new CEO James “JC” Curleigh and the change in vibe was palpable. Coming from iconic lifestyle brands like Levi’s and Chrome Industries, JC is well-versed in what’s “cool” and he’s wasted no time in applying that instinct to Gibson. 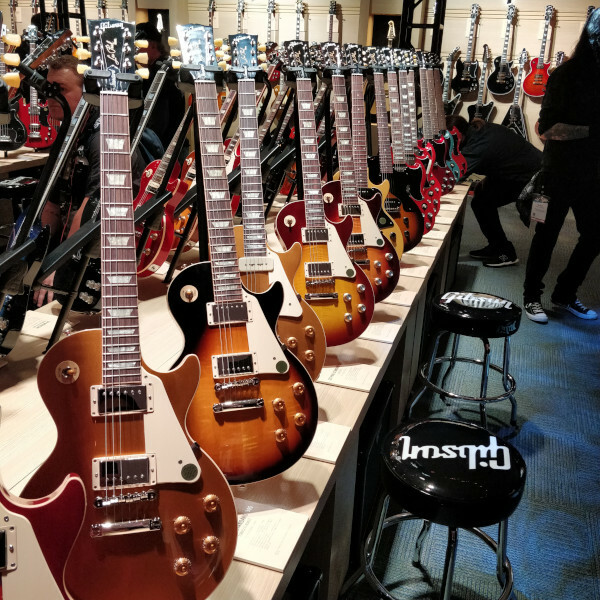 By doing away with model years, paring down their product lines, and making their price points more accessible, Gibson is poised to re-claim their throne as everyone’s favorite guitar brand. My personal favorites this year were the DC Junior Tribute Bass and the Special Tribute DC, which adds a second P-90 to their already popular single pickup Junior Tribute DC. Each year at NAMM, Fender introduces a series of limited production guitars with interesting features. This year, they’ve dubbed this the “Alternate Reality” series, all made in Mexico, putting them at price points that are accessible for a whole new range of players. The guitars will be available one by one, beginning in March, and will include a Tenor Tele, an Electric XII, a Powercaster, a Meteora, and a Sixty-Six. I was really into all of these models, but my two favorites were the Electric XII and the Sixty-Six. 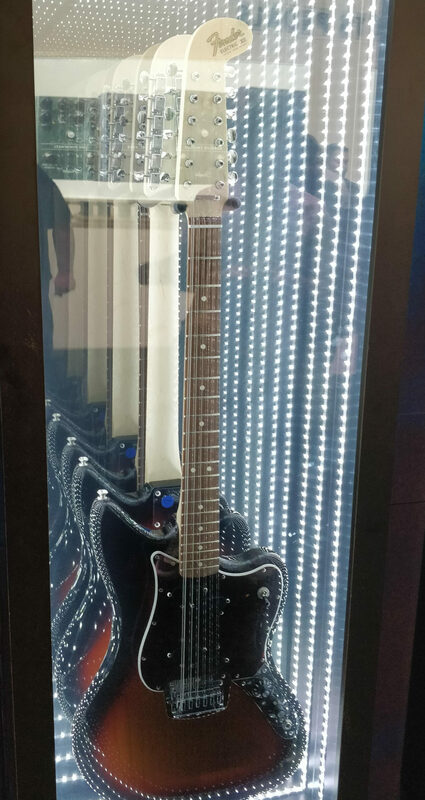 The Electric XII is a re-engineered version of the original Electric XII that was introduced in 1965 and is now a rarity on the vintage market. This model sports newly designed split-coil pickups, a modern C-shaped neck and the same familiar oblong headstock. The Sixty-Six is familiar, yet strange and hard to put your finger on exactly what it is. Its body is a slightly shrunken P-Bass, loaded with a Tele-style pickup configuration, and a synchronized tremolo. From there, you get a modern C-shaped maple neck and an oversized headstock. It’s a lot of different vibes working together to make something really cool. At its base was a man behind a drum shield hammering away at a hunk of bronze. 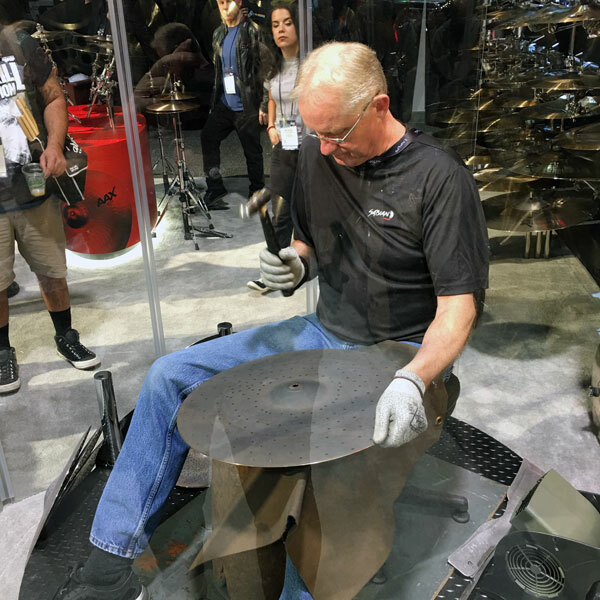 This man was hand-tuning cymbals live in front of the NAMM audience. What an incredible demo by Sabian to truly show off the “hand-crafted” nature of their cymbals, as well as inform the audience on how cymbals are tuned. As a vintage Marshall fanboy, the best thing I saw at NAMM was easily the amp giant’s release of their brand-new Studio Series amps. Expanding on the success of the Mini Jubilee, these 20 watt amps bring the cosmetics and sound of the JCM 800 and the 1959SLP Plexi to bedroom practices and small club gigs. Switchable down to 5 watts, you can get the same tone you’ve heard and loved for decades, but now at volumes that won’t peel paint off the walls. These Marshall Studio Series amps are available as both heads and combos, complete with stylish 1×12″ and vertical 2×12″ cabinets that match the different models. affordable price point, an area in which Gibson has been lacking as late. eye. A lot of great things about the new StingRay Special basses are here; ash body, lighter hardware, and compensated nut. For tone shaping, you get a single humbucker, parallel, series, and single-coil options, plus a push/pull passive bass boost. Available with either a maple or rosewood fretboard on its 30″ scale neck, these basses don’t lack any of the girthy low end associated with a StingRay, and give bassists who want to fly around a more navigable short-scale neck a bass that may look like the run of the StingRay litter, but has just as much bark and tonal bite. While I did feel a smooth presence with us, I unfortunately missed the one and only Carlos Santana pass right behind us, just like the ocean under the moon in a hallway during our meeting with D’Angelico. That would have easily been my top pick, but alas, my next pick is still pretty damn cool. 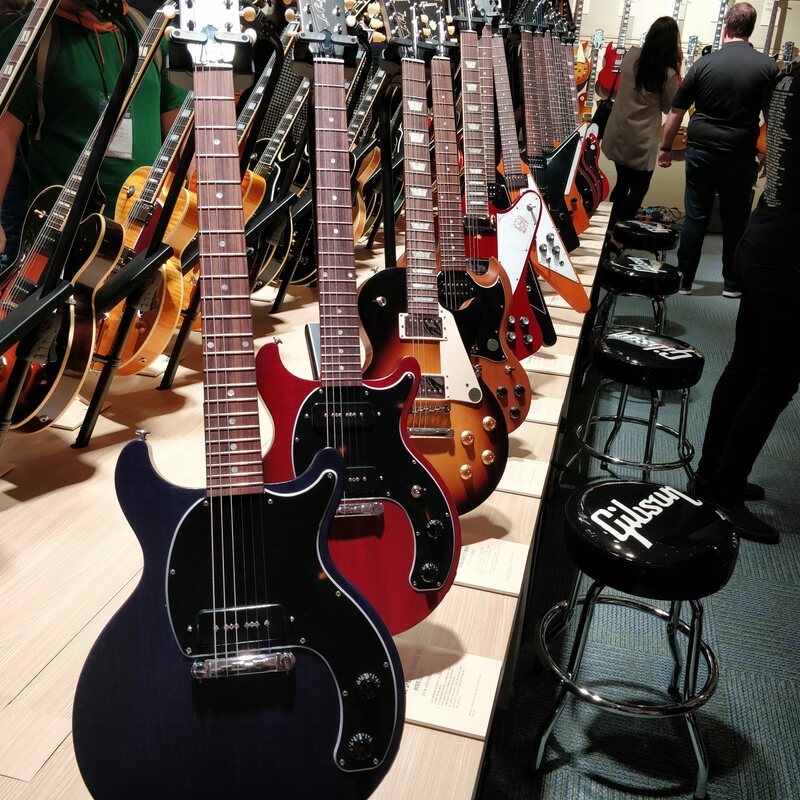 In the confines of NAMM’s basement, Hall E, lie a ton of smaller brands, independent luthiers and parts suppliers. Making my way through the thicket I stopped at a corner booth with an intriguing name: White Whale Guitar Co. This is a Monterrey, Mexico based shop run by luthier Alejandro Torres. On display were an incredible offset semi-hollowbody that attracted a ton of talented guitarists, a baritone double-cutaway LP Jr style model and a triple-humbucker, highly relic’d offset with Bigsby. While their website is currently under construction and they are likely way out of my price range, call me Ishmael because I’m definitely following them on Instagram to see where they go next. Keyboards, DJ, Live Sound & Recording Gear at NAMM 2019Dynamic vs. Condenser Microphones: Which to Use? Gibson finally figured out that musicians were its market, not music stores! Many years ago Gibson was very friendly to all at NAMM. Then some years back they got stiff with “dealers only” welcome at their booth. I see that with plummeting sales, they realized maybe letting folks actually touch and play the guitars….. Might even pick up sales!